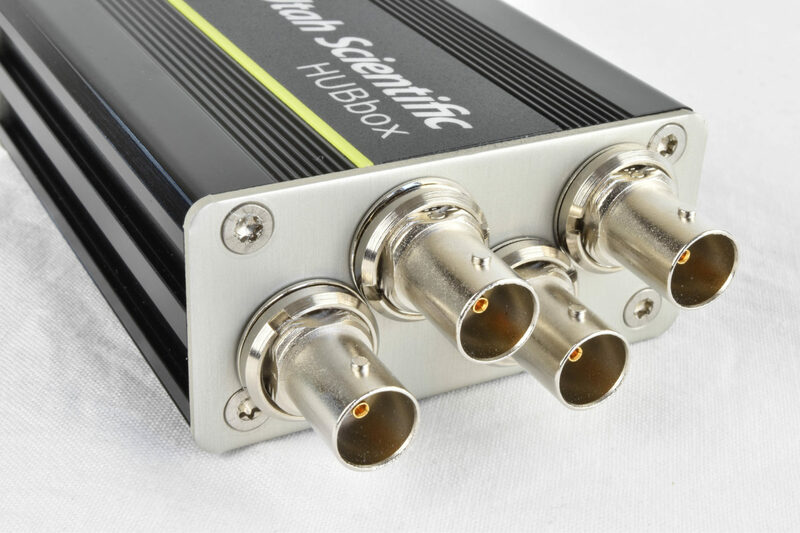 The HubBox Series is a collection of optical transmitters and receivers that are used to convert SDI signals to optical fiber. 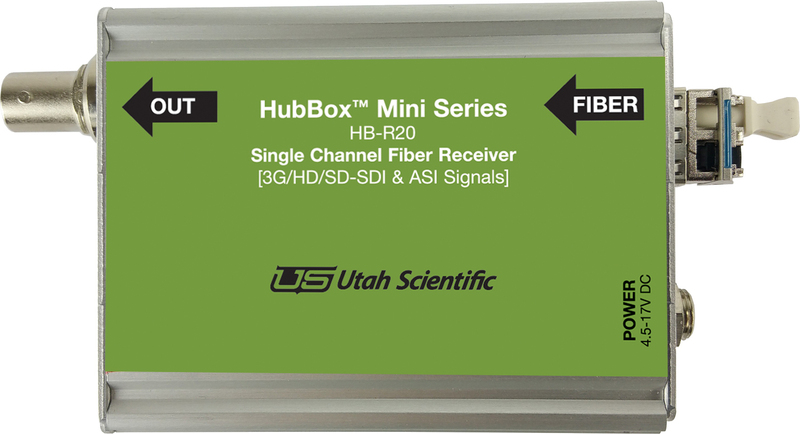 Each HubBox is capable of supporting 3G, HD, and SD-SDI as well as data rates from 50MBps to 3G. The HubBoxes are extremely compact and capable of portable application making them very ideal in a wide variety of uses. 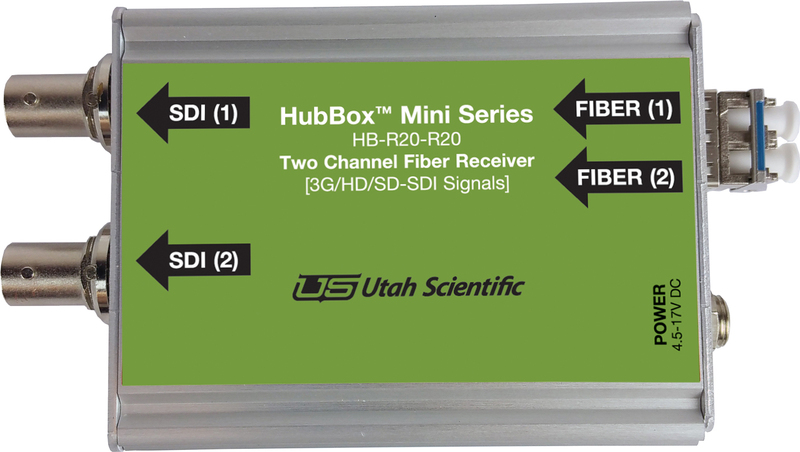 Utah Scientific’s HubBox HB-R20 is an optical receiver for converting signals from a single optical fiber to SDI. The HB-R20 supports 3G-, HD-, and SD-SDI and data rates from 50Mbps to 3Gbps. The unit is housed in an extremely compact and rugged aluminum case, making it ideal for both studio and portable applications. 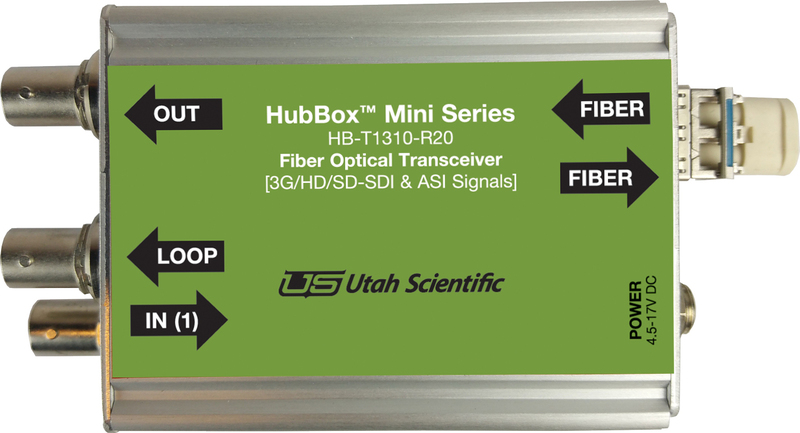 The Utah Scientific HubBox HB-R20-R20 is an optical receiver for converting signals from dual optical fibers to SDI. The unit supports 3G-, HD-, and SD-SDI and DVB/ASI, and supports data rates from 50Mbps to 3Gbps. The HB-R20-R20 is housed in an extremely compact and rugged aluminum case, making it ideal for both studio and portable applications. 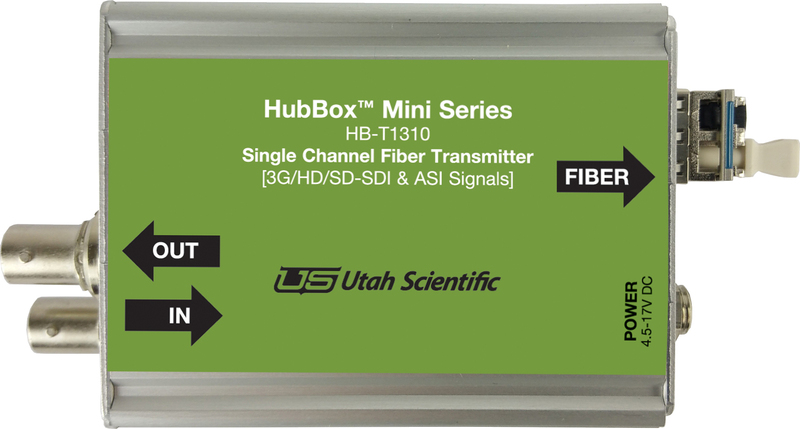 The HubBox HB-T1310 optical transmitter from Utah Scientific converts single SDI signals to optical fiber. The HB-T1310 supports 3G-, HD-, and SD-SDI as well as DVB/ASI, with support for data rates from 50Mbps to 3Gbps. The unit is housed in an extremely compact and rugged aluminum case, making it ideal for both studio and portable applications. The HubBox HB-T1310-R20 is an optical transmitter for converting a single SDI channel to optical fiber, or a single optical signal to SDI. The system supports 3G-, HD-, and SD-SDI as well as DVB/ASI, with support for data rates from 50Mbps to 3Gbps. The HB-T1310-R20 is housed in an extremely compact and rugged aluminum case, making it ideal for both studio and portable applications. 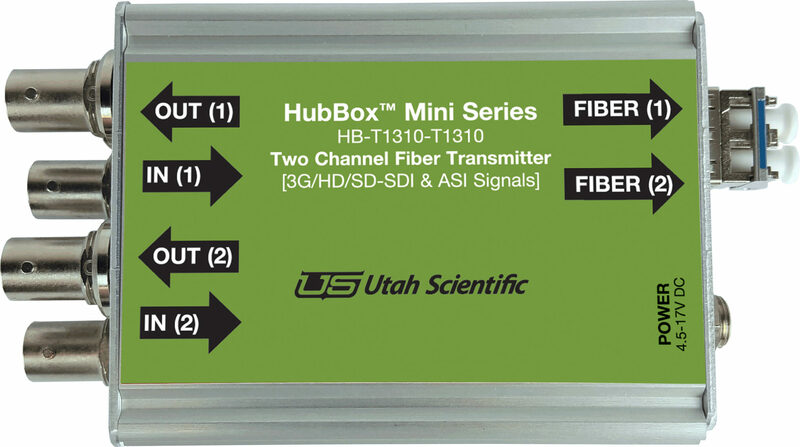 The Utah Scientific HubBox HB-T1310-T1310 is an optical transmitter for converting dual SDI signals to optical fiber. The system supports 3G-, HD-, and SD-SDI as well as DVB/ASI, with support for data rates from 50Mbps to 3Gbps. The HB-T1310-T1310 is housed in an extremely compact and rugged aluminum case, making it ideal for both studio and portable applications.